Otto-Bock Shoulder Support, Size: X-LargeElastic shoulder support provides warmth and a conforming fit.Made of 1/8“ (3.2mm) Thermoprene . Use to treat inflammation, pain or mild instabilities of the shoulder joint. D-ring attachment in front allows easy donning and doffing. Elastic strap helps prevent discomfort and pinching under the opposite arm. 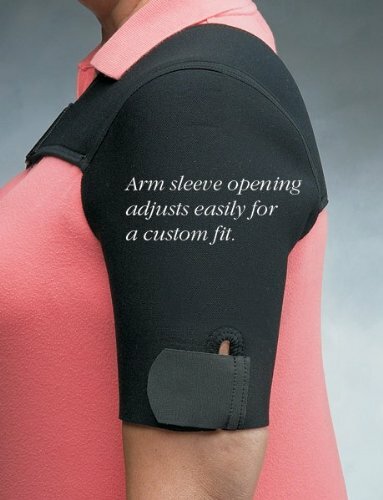 Sleeve opening allows for a custom fit. Hand wash, air dry. Latex free. Fits either the left or right shoulder. SizeS: Biceps Circumference 11“ to 12½ “ (28 to 32cm), Arm/Chest Width 18“ to 25“ (46 to 64cm)M: Biceps Circumference 11½ “ to 13¾ “ (32 to 35cm), Arm/Chest Width 18“ to 25“ (46 to 64cm)L: Biceps Circumference 13¾ “ to 15“ (35 to 38cm), Arm/Chest Width 20“ to 27“ (51 to 69cm)XL: Biceps Circumference 15“ to 16½ “ (38 to 42cm), Arm/Chest Width 25“ to 32“ (64 to 81cm) Product photo may not exactly match the product offered for sale. Please refer to the product description.